For a man who made his mark in the thundering cauldron of stock car racing, the memorial is deceptively quiet. The bronzed Earnhardt holds the massive Harley Earl trophy with one arm and the other has a fist raised high in the air, celebrating after a long-sought win in the Daytona 500 in 1998. The eyes smiling slyly above a wide grin and bristly mustache aren’t directed toward the sky or the horizon in a typical winner’s pose. An all-seeing gaze looks to where his fans would be, taking them in as much as they might be looking up at him, all reveling in the moment of triumph. That was Earnhardt, a big man who stood out but appreciated his fans as much as they admired his unalloyed commitment to prevailing against any odds. For all of Earnhardt’s outsized image as The Intimidator and his wealth minted from fame, he was committed to retaining his roots. He understood his work behind the wheel was symbolic of the struggles faced by stock car racing fans, most of them work-a-day Americans, the same as Earnhardt’s family. He also understood the sport he loved had always needed champions willing to help grow its popularity by being accessible. shoulders and neck slightly bowed as if to exemplify the strength and combative persistence needed by a champion. It is the classic posture of the 20th Century racing hero – standing his ground, testing himself against the resistance, propelled by an almost super-human inner drive to rise to the challenges posed by the sport and its inherent risks. There is a universal humbleness to the slightly stooped posture, which is also a reminder of the sad ending. The odds finally won at the Daytona 500 in 2001, when a typically aggressive Earnhardt was killed on the final lap by what seemed to be an uneventful meeting with the wall during a battle for third place. A few degrees in either direction in the angle of impact and the No. 3 car’s inertia would have been absorbed by an ongoing series of spins and impacts in place of one deadly thud at 160 mph. 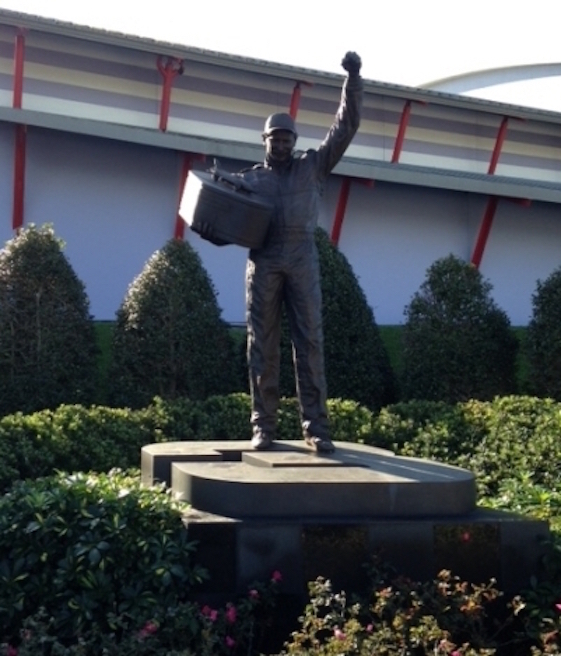 As the statue testifies, due to the tragic and sensational nature of his demise, Earnhardt will remain transcendent in the sport of stock car racing. But just as significantly, the legacy from Earnhardt’s untimely death will remain that of reducing the odds when it comes to the physical risks of motor racing. The man who so often dared to cheat destiny and dared his fellow competitors to do likewise stands forever at the intersection of two racing worlds – the one before his death from a basal skull fracture and the one after. Nobody in motor racing is more familiar with Earnhardt’s twin legacy than Jim Downing, the man who quietly began a safety revolution 20 years before Earnhardt was killed. After one of his fellow drivers was killed at the Mid-Ohio Sports Car Circuit in 1981 by a basal skull fracture, Downing asked a significant question – why can’t something be done about crippling or fatal head injuries in motor racing? Dr. Robert Hubbard, an accomplished professor of biomechanical engineering who got to know Downing as a result of marrying his sister and then buying a Porsche 911 from him, eventually answered that question. So here was Downing, a five-time IMSA road racing champion, in the NASCAR hauler during the annual January testing at Daytona in 2001 talking about the HANS Device to a longtime acquaintance, Mike Helton, the NASCAR president. In the previous year, three NASCAR drivers had been killed by head or neck injuries. Helton was entering his first full season at the helm of America’s largest racing organization. In the early 1980s, Downing had built Mazda RX-7 pace cars at his Downing Atlanta race shops for what was then called the Atlanta International Raceway, where Helton was the general manager and in charge of securing the cars to fulfill a sponsorship deal financed by Mazda. Not long after that deal with Downing, Helton left his post at the Atlanta track to take a similar job at Talladega before moving to Daytona Beach as a NASCAR employee and gradually working his way up the hierarchy to become president. To push the idea of making a HANS Device mandatory just like seatbelts and helmets in order to overcome drivers’ reluctance to use it, Downing and Hubbard had been making the rounds with major racing series officials for more than a decade. They could be seen trudging through paddocks and garages of the world’s major racing series year after year, including Formula 1, CART, the Indy Racing League and the Sports Car Club of America, trying to gain acceptance for their new safety invention. By the year 2000, the organizers of Formula 1 and CART – after some sensational and tragic accidents – had decided the HANS Device was a missing piece of the safety puzzle and began making steps to implement its use among the small cadre of drivers in their series at the top of the racing heap. But NASCAR and the Indy Racing League remained outside the fold when it came to official acceptance, despite the increase in fatal head injuries. Ultimately, NASCAR would beat both CART and F1 to mandating head restraints for all the races in its premier series when it started enforcing a mandate in October of 2001. Prior to the start of the 2001 season, Earnhardt had heard of the HANS Device through all the aggressive media coverage and seen Cup driver Brett Bodine wearing one as a result of the efforts by HANS Performance Products at the Indy test in the summer of 2000. But Earnhardt wanted nothing to do with the device. This was the same Dale Earnhardt who had resisted full-face helmets while riding in his Chevy in a singular and unusual laid back position, helmeted head cocked low, to the left and riding near the car’s B-pillar. The sightlines enabled him to get a unique view of the all-important left front of the car and its tire while cornering on ovals. The open-face helmet allowed Earnhardt to “feel the air” of the high-speed drafts – where he enjoyed an almost god-like status for his ability to maneuver. The full-face helmets were safer and used by 95 percent of the drivers, but Earnhardt wasn’t about to change a winning combination. Earnhardt wasn’t averse to safety. As the owner of the Dale Earnhardt Inc. team, he had held private discussions with NASCAR’s Gary Nelson, the chief technical official, about how to improve the safety of cars. Through Nelson, he was a regular follower of the progress on the so-called “soft walls” being experimented with at the University of Nebraska in a joint venture with the Indianapolis Motor Speedway. He had once flown to the GM Motorsports headquarters from North Carolina in his private plane to look at a new seat under development that was considered to be safer before declining to use it. It was Earnhardt who had suggested painting the yellow “out of bounds” line between the apron and racing surface of the tracks at Daytona and Talladega to improve both the competition and the safety, a rule that eventually became integral to the running of the races at those two high-speed tracks. Only Earnhardt knew if his response to the HANS was an effort to retain a competitive advantage – like the open-face helmet. Perhaps he considered an element of danger to be in his favor. It was just as likely that he simply didn’t believe in the strange looking device with its high collar and yoke, a response received from many star race car drivers around the world by Downing and Hubbard. Perhaps he thought it was unsafe to have this unfamiliar device in the cockpit. In any event, it was unstated but clear that Earnhardt would not be wearing the HANS Device on board the black No. 3 during the upcoming Daytona 500, a decision that would cost him his life – and help save hundreds of others. In the week after Earnhardt’s death, HANS Performance Products took more orders for its safety device than in the previous 10 years, the first major step toward universal acceptance of head and neck restraints.